Scroll down to find books on specific media such as silver, glass, porcelain, and furniture. Edwards, Ralph, and L. G. G. Ramsey, editors. The Connoisseur’s Complete Period Guides to the Houses, Decoration, Furnishing and Chattels of the Classic Periods. London: The Connoisseur, 1968. Heisinger, Kathryn B., and George H. Marcus. Antiquespeak: A Guide to the Styles, Techniques, and Materials of the Decorative Arts, from the Renaissance to Art Deco. New York: Abbeville Press, 1997. Brief essays discuss European and American styles, materials, types of objects, specialized areas of collecting (e.g. export wares), and processes related to acquiring and caring for antiques. Essays that define styles (e.g. Tudor) include sections on Who (principle artists, architects, designers, etc. ), When, Where (countries or continents in which a style was centered), and What (the origins, nature, and implications of the style). Lewis, Philippa, and Gillian Darley. Dictionary of Ornament. New York: Pantheon, 1986. A survey of ornament, pattern, and motif in the applied arts and architecture, covering mainly European and North American buildings and objects from the Renaissance to the present day “with reference, where relevant, to ancient and oriental sources and precedents.” Illustrations demonstrate the ways in which a motif, pattern, or theme may be interpreted in various media. A “visual key” functions as a visual dictionary that refers to definitions of ornamental details. Includes references. Trench, Lucy, editor. Materials and Techniques in the Decorative Arts: An Illustrated Dictionary. Chicago: University of Chicago Press, 2000. Describes and illustrates the materials and techniques used in the decorative arts, defined as “those objects and forms of decoration that have a practical purpose but are also prized for their beauty and craftsmanship.” Materials covered include seven “core” materials—textiles, metals, wood, ceramics, glass, stone, and paper—as well as gemstones, ivory, lacquer, leather, and shell. The focus is primarily Western art but does include non-Western arts in such materials as lacquer and jade. Clayton, Michael. The Collector’s Dictionary of the Silver and Gold of Great Britain and North America. Woodbridge, Suffolk: Antique Collectors’ Club, 1985. Covers mainly the time period 1150 to 1880. Lavishly illustrated dictionary of terms, styles, materials, tools, patterns and motifs, and forms. Also includes biographical entries. Many entries include selected bibliographies. De Castres, Elizabeth. Collecting Silver. London: Bishopsgate Press, 1986. Brief historical overview of silver, followed by chapters on specific objects: boxes, flatware and utensils, tea silver, table silver, wine silver. Chapters on hallmarks, pitfalls for collectors, Sheffield plate and electro-plate, and the care of silver. Holland, Margaret. Phaidon Guide to Silver. Englewood Cliffs, NJ: Prentice-Hall, 1983. Intended to “give an understanding of the essential qualities of silver and to enable the reader to recognize the style and period of those pieces that are likely to be seen in the average saleroom, shop, or museum.” Deals largely with silver of the Western world. 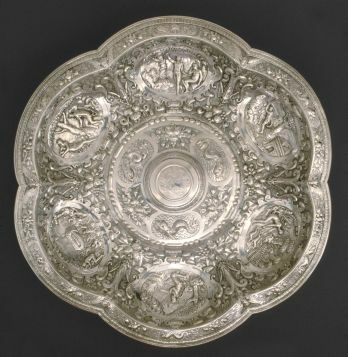 Gives definitions and descriptions, illustrated with examples, of early European silver, ecclesiastical plate, wine vessels, table silver (for the dinner table and the tea table), flatware, lighting, bedroom articles, social articles, decorative silver, and small collectibles. Includes an illustrated glossary of technical terms and motifs, an illustrated discussion of silver marks, and brief bibliography. Venable, Charles L. Silver in America 1840–1940: A Century of Splendor. Dallas, TX: Dallas Museum of Art, 1994; New York: H. N. Abrams, 1995. Exhibition catalogue that provides an overview of the history of mid 19th- to mid 20th-century American silver, with chapters on “Foundations Laid, 1840–1875,” “Glory Achieved, 1875–1915,” and “Restructure and Reform, 1885–1940.” Lavishly illustrated, with extensive notes and bibliography. Includes a section on biographies of selected silver producers and retailers. The library’s collection includes many books on the silver and gold hallmarks of specific countries, cities, or regions. To find books on the hallmarks of a given country or region, try searching our online catalog, or browse the shelves near the call numbers NK7210 and NK7211. Following are several examples of books on the hallmarks of French, English, and American silversmiths. Beuque, Emile. Dictionnaire des Poinçons Officiels Français et Étrangers, Anciens et Modernes de leur Création (XIVe siècle) à nos Jours. Paris: F. de Nobele, 1962. Dictionary of the hallmarks on French and other European silver, gold, and platinum from the 14th century to the early 20th century. Both volumes are in two parts: “Figurines et objects” and “Lettres, cheffres, et signes.” Each hallmark is reproduced and identified. Hallmarks in volume II are primarily after 1789. At the ends of both volumes: Table nominative des poinçons, Table des poinçons classés par pays, Table des poinçons particuliers à chaque ville. Culme, John. The Directory of Gold & Silversmiths, Jewellers and Allied Traders 1838–1914 (from the London Assay Office Registers). Woodbridge, England: Antique Collectors’ Club, 1987. Divis, Jan. Silver Marks of the World. London: Hamlyn, 1976. Marks are arranged according to the objects/subjects they depict. Information for each mark includes the town and country where the hallmork was used, the date when it was employed, and, where possible, the purity the mark guarantees. Also included are marks stamped by control bodies (i.e. municipalities, state institutions, or guilds) and marks that are important in determining the country and place of origin of an item. Emphasis is on antique silver; most the recent marks are from the 1930s. Green, Robert Alan. Marks of American Silversmiths, 1650-1900. Key West, FL: R. A. Green, 1984. Useful as a research guide as well as containing the marks for many silversmiths. Information on how hallmarks and trademarks were used in America, with references to other works that give more detail about specific time periods or places. “Illustrated with 300 original photographs and 4,000 drawings of marks of silversmiths, jewelers, watchmakers, clockmakers, and vendors.” Also includes a lengthy bibliography and an index of names and initials. Grimwade, Arthur G. London Goldsmiths, 1697–1837: Their Marks and Lives from the Original Registers at Goldsmiths’ Hall and Other Sources. London: Faber and Faber, 1990. Jackson, Sir Charles James. English Goldsmiths and Their Marks, a History of the Goldsmiths and Plate Workers of England, Scotland, and Ireland, with over Thirteen Thousand Marks… New York: Dover, 1921. Invaluable standard reference work of the marks of British workers in gold and in gold and silver. Arranged geographically with chapters on goldsmiths from London, York, Exeter, Chester, Sheffield, Glasgow, and Dublin. Also includes detailed information on the legislation and standards concerning goldsmiths and the manufacture and sale of gold and silver wares. Stacks NK7143 J3 1921 Repr. Rainwater, Dorothy T., and Martin and Collette Fuller. Encyclopedia of American Silver Manufacturers. Atglen, PA: Schiffer, 2004. A premier reference source for maker’s marks on American silver and for manufacturers of American silver. Aims to record “as much historical and maker’s mark information as possible,” both for posterity and for the use of collectors, appraisers, and historians. Alphabetical entries for manufacturers include information about the company and photographs or line drawings of marks. Boger, Louise Ade. The Dictionary of World Pottery and Porcelain. New York: Scribner, 1971. A collector’s guide to ceramics, arranged in dictionary format. Includes line drawing illustrations and reproductions of marks in the margins. A section of photographs is arranged chronologically and by region. Also includes a lengthy bibliography, not annotated but organized by topic. Cohen, David Harris, and Catherine Hess. Looking at European Ceramics: A Guide to Technical Terms. Malibu, CA: J. Paul Getty Museum in association with British Museum Press, 1993. Gives definitions of the terms commonly used by artists and art historians in describing and discussing the manufacture of European ceramics. 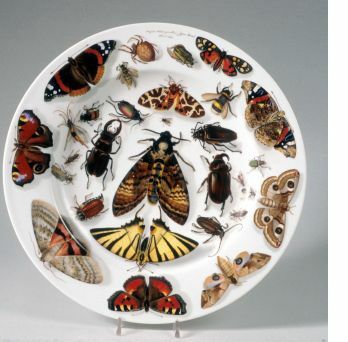 Definitions will aid museum or gallery visitors in understanding label and catalogue text, and will provide an understanding of the techniques involved in producing earthenware, stoneware, and porcelain works of art. Cushion, J. P. and William Honey. Handbook of Pottery and Porcelain Marks, 5th edition. London: Faber and Faber, 1996. Expanded edition of an essential reference work on pottery and porcelain marks of the world. Arrangement is alphabetical by country and town. Includes for each country a section on how marks were used and details to watch for. Use in combination with Kovel (below) if you have a mark but do not know which country it came from. Includes index. Faÿ-Hallé, Antoinette, and Barbara Mundt. Porcelain of the Nineteenth Century. English translation by Aileen Dawson. New York: Rizzoli, 1983. All chapters have sections for specific countries and cities. Chapters include: “The Techniques of 19th-Century Porcelain;” “1800–1830: The Triumph of Painting;” “1830–1850: From Art Institute to Industrial Manufactury;” “1850–1880: Historicism,” and “Eclecticism and Art Nouveau.” Lavishly illustrated, and can therefore be used as a kind of visual dictionary. Also includes a catalog of porcelain marks, and a lengthy bibliography classified by country. Honey, William Bowyer. European Ceramic Art from about the End of the Middle Ages to about 1815: A Dictionary of Factories, Artists, Technical Terms, et cetera. London: Faber and Faber, 1952. Kovel, Ralph and Terry. Dictionary of Marks: Pottery and Porcelain. New York: Crown Publishers, 1953. Kovel, Ralph and Terry. Kovels’ New Dictionary of Marks. New York: Crown Publishers, 1986. Companion volumes. The 1953 book is a listing of marks of the 17th, 18th, and early 19th centuries; the 1986 book identifies 3,500+ marks on 19th and 20th century American, European, and “Oriental” pottery and porcelain. In each book, the first section is a listing of marks organized by objects or designs, e.g. crowns, shields, birds. The second section is an alphabetical listing of marks that are initials or words. With each mark is the name of the factory, location, type of ceramic, how the mark was applied, and the date of the mark. Where possible, information also includes the dates of the factory, current name of the successor company, and the special name of the mark used by American collectors. Includes indexes and bibliographies. Wang Quingzheng. A Dictionary of Chinese Ceramics. Singapore: Suntree Marketing, 2002. An important reference work on Chinese pottery, stoneware, and porcelain. Chapter 1 illustrates 500+ shapes and forms found in Chinese ceramics from Neolithic times to the present, with a section of line drawings that functions as a visual dictionary of shape and form. Chapter 2 is a dictionary of materials and techniques in ceramic production; also includes entries on defects, flaws, restoration, and forgery. Chapter 3 details kiln sites, ancient and modern; also Chinese guilds, factories, and cooperatives. Chapter 4 is on decorative technique; Chapter 5 covers “vast varieties of designs, styles, motifs and their symbolism,” illustrated with line drawings that function as an analysis of patterns. Chapter 6 catalogs makers’ marks and inscriptions, grouped in dynastic periods. Chapter 7 includes biographical notes on famous potters and an annotated bibliography. Hartmann, Carolus. Glasmarken Lexikon 1600–1945: Signaturen, Frabrik- und Handelsmarken, Europa und Nordamerika. Stuttgart: Arnoldsche, 1997. Important dictionary of glass marks of Europe and North America. Texts in German, English, French, and Japanese. Section 1: illustrations of marks. Section 2: biographies of artists and firms. Section 3: terminology, glossary, index of place-names, bibliography, and index. Marks are grouped according to appearance into 20 groups (e.g. initials, weapons, animals, tools). Check introductory pages for instructions on using the dictionary. Klein, Dann and Ward Lloyd, editors. The History of Glass. London: Orbis, 1984. A general work that serves as a guide to “the whole subject in its enormous sweep.” Chapters are chronologically arranged: origins and early history, dark ages to early Constantinople, Medieval to Renaissance, 17th century, 18th century, 19th century, art nouveau glass, glass between the wars, and glass since 1945. Includes a glossary, bibliography, and index. Mehlman, Felice. Phaidon Guide to Glass. Oxford: Phaidon, 1982. Intended for collectors of glass. In contrast to most books, which describe the history and chronological development of glass, this book is organized by types of objects in order to emphasize specific forms and functions. Includes chapters on drinking vessels, serving drinks, serving food, the desk, lighting, decoration, personal use, walls and windows, later artists, and decorative styles. Also includes a short history of the principal manufacturing countries/regions, a chapter on collecting, brief bibliography, glossary, and index. Aronson, Joseph. The Encyclopedia of Furniture, 3rd edition. New York: Crown, 1965. Definitions and descriptions of furniture terms, techniques, styles, and forms, with longer articles on such larger subjects as America, chair, construction, France, Gothic, Modern, etc. Especially useful for the large number of illustrations and photographs. Includes a lengthy bibliography. Boyce, Charles. Dictionary of Furniture. New York: Henry Holt, 1985. Attested to be “the most comprehensive listing in a single volume of terms that refer to furniture—its style, manufacture, and makers—in all countries and cultures.” Includes definitions and descriptions of stylistic elements, materials, forms, details of construction, and aesthetic terminology; also includes brief biographies of important cabinetmakers. Illustrated with line drawings. Grimm, Claus. The Book of Picture Frames, With a Supplement on Frames in America by George Szabo. New York: Abaris Books, 1981. Brief essays touch on the origin and development of picture frames and a historical survey, but the main part of the book functions as a picture dictionary with sections on types of frames (e.g. architectonic) and place/time period (e.g. 17th century English). Includes a glossary of special terms and bibliography. Joyce, Ernest. The Technique of Furniture Making. London: B. T. Batsford, 1970. Textbook on furniture-making; useful for understanding materials, techniques, and basic construction. Chapters on tools and equipment, materials (e.g. timber, veneers, adhesives, and abrasives), basic techniques of joinery, veneering, laminating, etc., and basic construction of carcases, legs, plinths and cornices, doors, drawers, metal fittings, etc. Includes bibliography and index. Mitchell, Paul, and Lynn Roberts. A History of European Picture Frames. London: P. Mitchell in association with Merrell Holberton, 1996. First published as the article on frames in the Turner Dictionary of Art (Reference N31 D48). Organized by country and then by time period/style (e.g. Italian Renaissance, Mannerist, Baroque, 19th and 20th centuries). Morley, John. The History of Furniture: Twenty-Five Centuries of Style and Design in the Western Tradition. Boston: Little, Brown and Company, 1999. Stylistic survey of the history of furniture from antiquity to the “latter-day polarities” of Art Nouveau and 20th-century neoclassicism; describes the development and characteristics of furniture in the Western tradition. Lavishly illustrated. Includes a select classified bibliography. Payne, Christopher, editor. Sotheby’s Concise Encyclopedia of Furniture. London: Conran Octopus, 1989. Intended as a reference for collectors of antique furniture; traces trends and influences. Chronologically organized chapters cover the great movements in furniture design: Renaissance, Rococo, Classical Revival, and Modern. Chapters cover manufacturers and designers, and contain detailed information on decorative techniques such as veneering and marquetry. Lavishly illustrated. Includes bibliography, glossary, and index. Maker's mark IV with a star below, probably Dutch or Flemish, active in England in the 17th century. Basin, 1618. Silver. Acquired in honor of Charles Buckley. Sterling and Francine Clark Art Institute. The hexafoil basin is raised from a single sheet, its six lobes concave and its center slightly domed. The border is chased with sea monsters, fruit clusters, and winged cherub's heads, all against a matted ground; a stamped tongue-and-arch molding is pinned and soldered to its outer edge. Each lobe is chased in repoussé with a scrolled cartouche, within which is chased a different Old Testament scene. The cartouches are separated by vertical split-tailed marine creatures, their curled and forked tails chased with scalework. Beneath each creature is a cluster of fruit and foliage, the entire scheme chased against an extensively matted ground. The domed center is encircled by a plain border chased with bead-and-spindle ornament, enclosing three cartouches chased with sea monsters against waves and with clusters of fruit and foliage against matting. At the center is soldered a large circular boss comprising a stamped tongue-and-arch border beneath a seamed ribbed molding, a rounded and worn tongue-and-arch molding, a plain upper surface, and another ribbed molding into which the central cap fits. The cap is composed of a seamed circular bezel with scalloped edge and a circular disk with plain applied molding. The disk is engraved with the coat of arms and crest within feather mantling. The chaser's original pricking marks are visible on the entire underside of the basin, particularly behind the figural scenes. Marks: Fully marked on underside center: maker's mark IV, star below (Jackson 1921, p. 114; 1989, p. 107); leopard's head; lion passant; date letter a for 1618/19. Benjamin Stephenson. Teapot and stand, 1790-95. Silver. Acquired by Sterling and Francine Clark, 1929. The octagonal teapot is constructed from sheet, seamed vertically at the handle. It has a flat applied top, cut with an oval opening, and an applied lip molding. The octagonal base is inset. The tapered octagonal spout is made from seamed sheet and has 48 strainer holes pierced in a triangular formation behind it. The C-scrolled wooden handle is attached to each of the octagonal sockets with a silver pin. 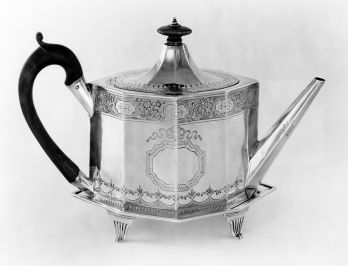 Various bright-cut borders are engraved on the upper and lower body and the top of the teapot. A vacant octagonal medallion surmounted by a bow-tied ribbon is engraved at the center of each long side. Dotted bright-cut borders ornament the handle sockets as well as the lip and base of the spout, which is engraved at its midpoint with two paterae. The peaked octagonal cover is raised and has a narrow applied molding. It is ornamented at its dome and lip with bands of bright-cut engraving and is attached to the body with a flush 5-part hinge. The finial is composed of a stained ivory button and a silver bolt with beaded cap, affixed to the cover with a small silver nut. There is an air hole in the cover beside the finial. The finial is a replacement and fits poorly. The oval stand, which is hammered from sheet, has a narrow flared lip with applied molding and four cast reeded feet. It flat surface is engraved with bright-cut borders and a central medallion matching those on the teapot. Acquired by Sterling and Francine Clark, 1929. Marks: Fully marked on underside of teapot: maker's mark B.S (possibly Grimwade 227) overstamping an obliterated mark; lion pasant; sovereign's head; leopard's head; date letter p for 1790/91. Lion passant and obliterated maker's mark on underside of cover. Fully marked on underside of stand: maker's mark B.S (possibly Grimwade no. 227) overstamping an oblitered mark; lion passant; leopard's head; date letter t for 1795/95; unidentified mark. Robert Hennell I, Britain. 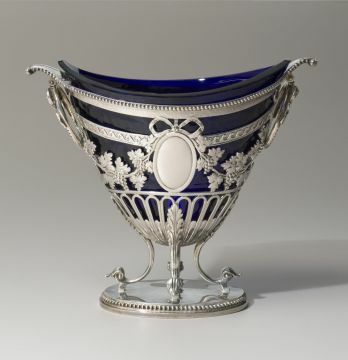 Sugar basket, 1782/83. Silver and blue glass. Sterling and Francine Clark Art Institute, Williamstown, MA. Marks: Fully marked on underside: maker's mark RH (Grimwade 2330); lion passant; leopard's head; date letter g for 1782/83. Marks: Impressed on reverse: 18 840 LIPPERT & HAAS IN SCHLAGGENWALD. 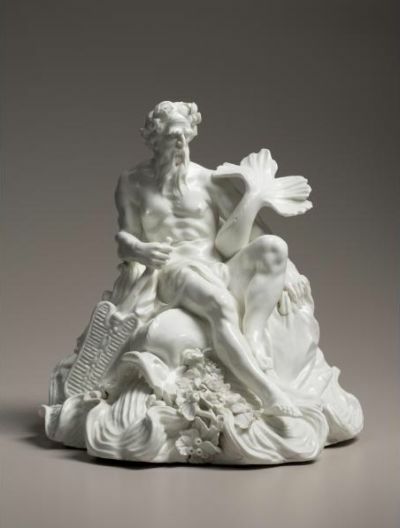 White glazed bearded river god on a dolphin among waves with a large shell in back. Paddle held in right hand. Flowers & leaves applied to front of base to disguise fire crack. Maker unknown. Footed cream pitcher, 1820-60. 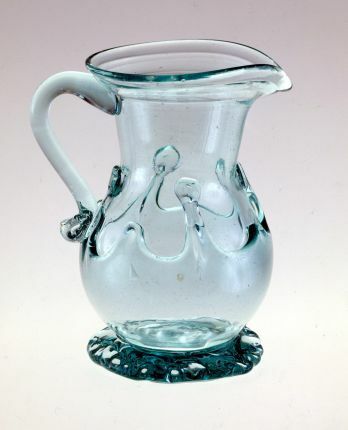 Aquamarine glass with applied lily pad decoration, handle, and crimped foot. The Albert and June Lauzon Collection of Early American Blown Glass. Sterling and Francine Clark Art Institute. Attributed to American Flint Glass Works, American. Pocket Bottle, 1770s. 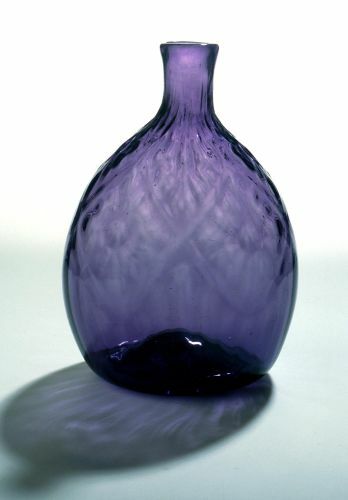 Amethyst mold-blown glass. Acquired with funds donated by June Lauzon. Sterling and Francine Clark Art Institute. Manufactured by Johnstone, Norman, & Co. Designed by Sir Lawrence Alma-Tadema. 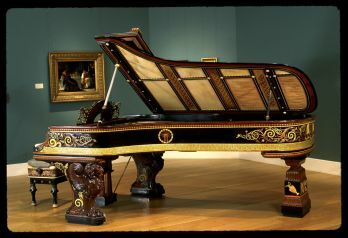 Instrument and case by Steinway & Sons, New York. Fallboard painted by Edward John Poynter. Model D Pianoforte and Stools, No. 54538, 1884-87. Ebony veneer with boxwood, sandalwood, cedar, ivory, coral, mother-of-pearl, copper, brass, and pewter. Acquired by the Sterling and Francine Clark Art Institute.